An Easier Way to Roll! Any solar blanket can cover up your pool. But only ClearDeck® can cover up your solar blanket! With ClearDeck®, covering and uncovering your pool couldn’t be easier. Designed for convenient, one-person operation, Cleardeck’s patented design requires minimal effort. See for yourself – click here to view a short video on the ClearDeck Web site! ClearDeck sits flush with your deck when closed, your deck is free of clutter and the reel will not present a trip hazard. Plus, your solar blanket will be hidden out of sight and stored properly year round. When it comes to your pool, the ClearDeck® In-Ground Solar Blanket Roller is as essential as the water! If you’re a first-time pool buyer, you may not fully realize how much money you can save while keeping your pool warm and ready for swimming. The good news is, there’s an easy solution that will provide big savings: a solar blanket. You would never run your home furnace while leaving the windows and doors open. But that’s exactly what you’re doing if you heat a pool without a solar blanket. 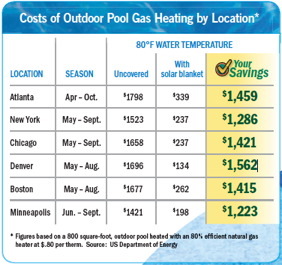 A solar blanket prevents heat loss from your pool, so you won’t have to run your pool heater as often, drastically reducing the cost of heating while maintaining your pool at the perfect temperature. How does a solar blanket save you money? During the day, a solar blanket acts as a heat collector, naturally increasing the temperature of your pool with minimal or no use of a heater. When night falls, the solar blanket prevents the warmth from escaping – reducing heat loss in your pool by up to 90% compared to leaving your pool uncovered. Additionally, a solar blanket will reduce chemical use and water evaporation. From rectangle to free-form, the ClearDeck system is ideal for any shape or size of pool and can be installed in any type of deck surface. 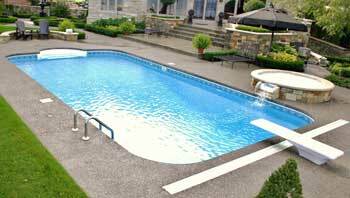 If you’re considering a new pool, or renovating an existing pool deck, make sure you consider ClearDeck. A solar blanket is the only swimming pool accessory that not only pays for itself, but will also save you money for many years to come. While other features such as pool lights and waterfalls may be eye-catching, they will never provide you with any actual savings. When you really think about it, a solar blanket really is as essential for your pool as the water! After all, your pool is in-ground… your solar blanket should be, too!